It’s Dungeness crab season in northern California, and it’s something of a tradition for coastal folks to have crab for their Christmas dinner. While we moved inland a few years back, that doesn’t mean that Charles and I are willing to give up our coastal traditions. The store has been selling Dungeness precooked, which made our dinner preparations even easier this year, and since we are inland, it makes sense to sell them that way. While cooked and paired with a Beaujolais Nouveau or crafted into an amazing stew called Cioppino and served with hot sourdough bread are the traditional ways to consume this amazing crab, I — not surprisingly — did something slightly different this year. 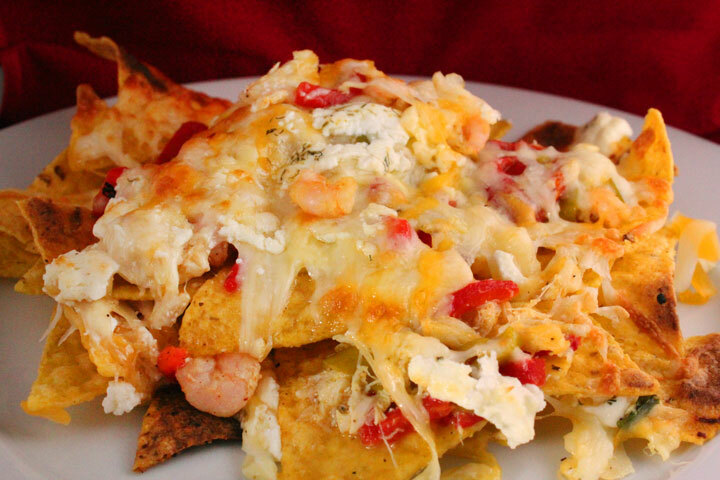 I combined the crab with precooked shrimp and made gooey, amazingly addictive, nachos. I paired our meal with another West Coast tradition, Anderson Valley Brewing Company’s awesome seasonal beer, Winter Solstice. Its hints of toffee and spices went well with the rich flavors of the seafood and chevre, and its creamy mouthfeel was perfect with the melted cheese. Since tomorrow is Solstice, pick some up to toast in the returning light — and to pair with your own shellfish nachos. In a small pan, melt butter over low heat and toss in shellfish, nutmeg, green onions, and garlic. Stir until garlic becomes fragrant. Add lemon juice, pepperonchinis, and roasted red bell peppers and stir until well mixed. Turn on broiler to high. Adjust the oven rack to be about six inches below the broiler. Heap chips onto a cookie sheet. Scatter the contents of the pan, sprinkle on the mozzarella, and then top with the chevre. Place in the oven and cook until the cheese begins to bubble and turn golden brown. Separate your cheesy, gooey mess evenly onto six dinner plates and serve right away.